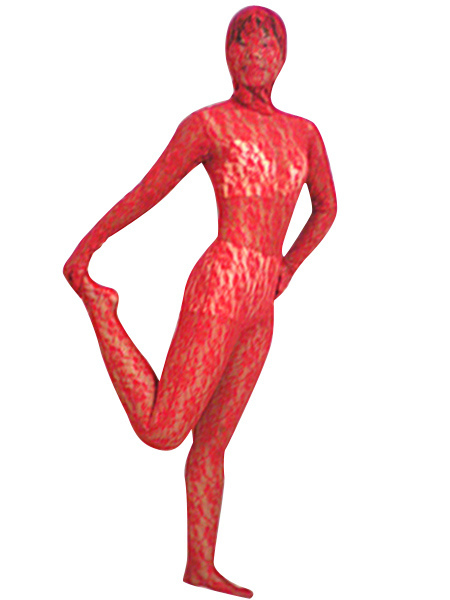 Zentai suits, also known as catsuits, are quite popular in the music, video and theater industry. They are also great for Cosplay and role playing as well. They give the appearance of a second skin and the texture used in making the suit determines the effect it will have. It might be a shiny latex or scales or something totally transparent. Most of them are all-inclusive, meaning all parts of the body are covered. Others are semi-inclusive, meaning some parts of the body are left exposed – like the hands, head or feet. This one is all-inclusive and made from a gorgeous red lace. The suit is quite sheer so wearing something underneath it is necessary, if you don't want to be overly exposed. Amazing! it reveals my good shape of body, and i like it. The design of it is great, and feels good , too.